We’ve been up to our elbows in life and flat admin here at ASH HQ. Lots of late Spring cleaning- out with the old, in with the new. Well, less of in with the new, actually. Mostly chucking out the old in overflowing bin bags destined for the tip. 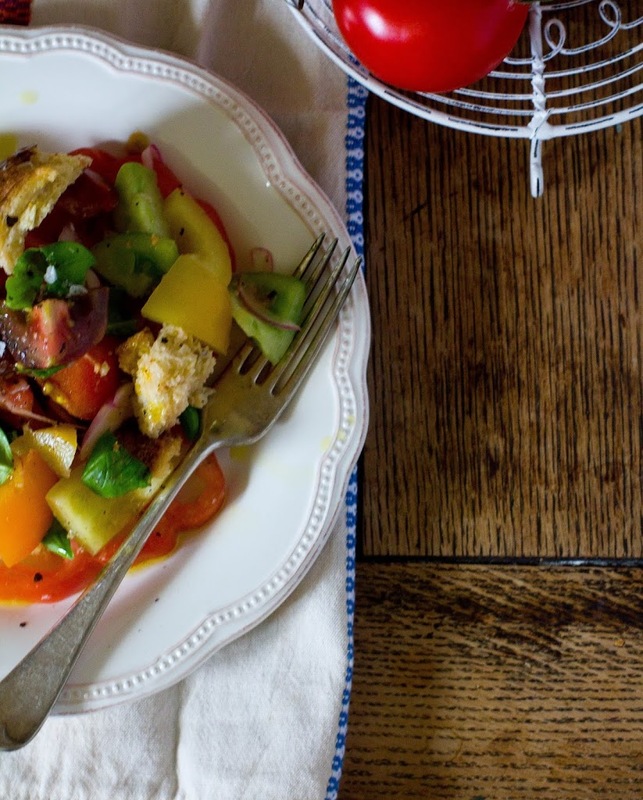 For hot, sorting days you need something quick and easy that you can eat standing up, spooning into your mouth between outbursts of ‘ I wanted to keep that!’ Panzanella is excellent throw-together weekend food. This Italian bread and tomato salad is summery and fresh, but still satisfying enough to fuel lugging and lifting. 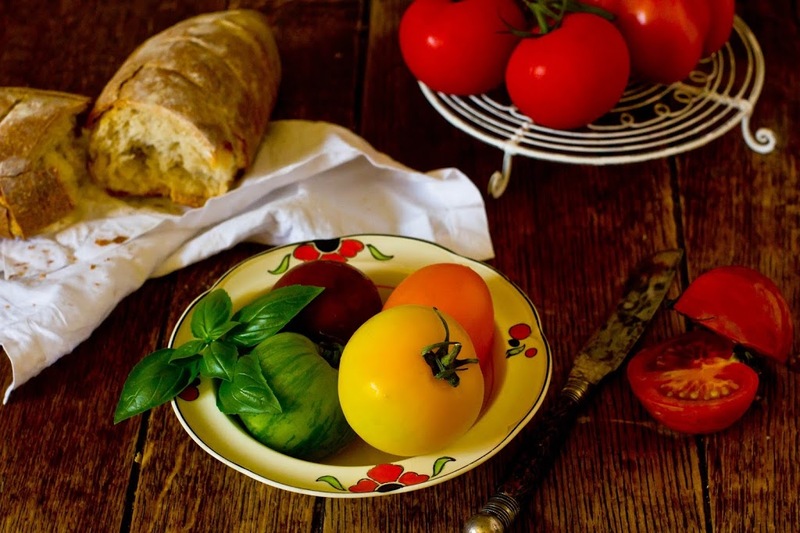 And although I’m not suggesting that heritage tomatoes are easy to come by, my local (not fancy) greengrocers has recently started stocking them, so they can be found if you look out for them. Of course, normal tomatoes would work just as well- ideally plump, ripe ones on the vine. Controversially, I’ve added Dijon mustard to my recipe. It is by no means traditional, but I love mustard in my salad dressings, so I’ve added it here for a bit of peppery sharpness. Taste your tomatoes before you make the dressing, if they are a bit under-ripe and don’t have much in way of sweetness, perhaps replace the Dijon with some balsamic for some sugar with that acid hit. 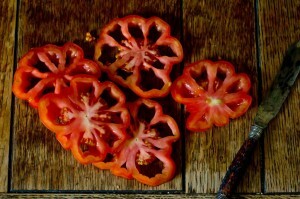 A final note on storing tomatoes- there is nothing worse than biting into a cold, firm tomato. For this recipe, take them out of the fridge and let them come to room temperature. 1. First, slice the red onion finely. Place in a bowl and pour over the juice of half a lemon. Mix thoroughly, cover, and set aside for about an hour. The onion will loose its rawness and turn a beautiful, vibrant purple. 2. Chop up the tomatoes- it doesn’t have to be especially neat. Place in a large bowl. Tear the bread into chunks and add these to the bowl along with the onions, drained of the lemon juice. 3. Mix together the dressing to your liking. Mine was about 1 tbsp lemon juice to 3 tbsp olive oil and 1 tsp Dijon, along with plenty of salt and pepper. Toss these over the rest of the ingredients and leave for a few minutes before finally adding torn basil leaves. I must try this today! 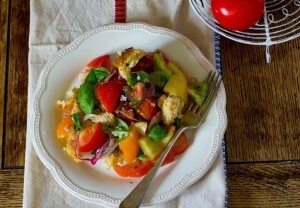 Such a wonderful twist on panzanella, love it! !